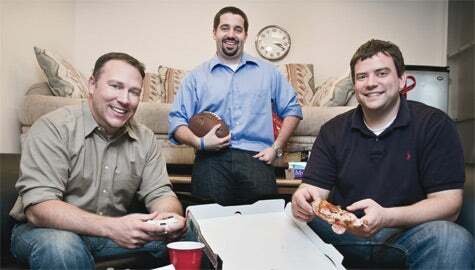 United: From left, Glynn loPresti, Michael Rihani and Patrick Gartlan. At Virginia Tech, the term "koofers" has long referred to the practice of sharing study materials among friends and across classes. The rub? Until alums Glynn LoPresti, Michael Rihani and Patrick Gartlan stepped in by founding Koofers Inc. in 2006, students had to be friends with a classmate to share notes--and had to be part of Virginia Tech. LoPresti, a 1995 graduate; Rihani, a 2008 graduate; and Gartlan, a 2007 graduate, changed this by combining their individual startups to create a whole greater than the sum of its parts. Intent on unleashing the worldwide potential of academic "koofers" by joining the concept with the reach of the Internet and the spread of social media, each of the then-unacquainted co-founders originally pursued his own website. LoPresti bought the domain Koofers.com, Gartlan bought Koofers.org and Koofers.net, and Rihani--finding no remaining domains but great potential in the overlap--united the group under their collective goal. "Because we all had the same idea, we had the same goal to level the playing field … and create an academic platform that went beyond the initial sharing of study materials and extended to include professor ratings, grade distribution data and more," Rihani says. The concept was simple: create a universally accessible studying environment where students could share materials, thoughts on courses and professors and even tools to create flashcards and plan schedules. By leveraging the collective will and sociability of the student demographic--while remaining aligned with universities by collecting data and encouraging department collaboration--the jointly reformed Koofers.com gained enough momentum to grow from a one-campus beta trial in 2006 to a 400-campus platform in 2009--and a soon-to-be 1,000-campus platform this year. The reason? Commonality. The laws of science are the same at Virginia Tech as they are at University of California, Los Angeles, which means the content in chemistry classes is usually the same as well. By logging into Koofers--which has a Facebook app and is accessible online via Facebook ID and password--a student in an introductory chemistry class of 30 can now swap and share materials with tens of thousands of students studying the same curriculum worldwide. With a base of more than 360,000 students hailing from more than 2,000 universities around the globe, the 15-person company plans to continue rapid expansion throughout 2011. Koofers.com is free for users and doesn't even allow advertising on its site. In fact, the company banks much of its revenue model on saving students money. "One of the ways we monetize the site is by providing a price comparison tool for textbooks that helps students find the absolute lowest price, and we then get a commission from the seller," LoPresti says. "This is helpful for our users--and a way for us to make money without having them actually pay us."